Dawn is my preferred time of day to take photographs, even though I’m not much of a morning person. In the spring and summer this can be particularly grueling, as sunrise is at an unforgiving hour, usually 4-5am. It’s not easy getting up that early at the best of times, especially when you have a full-time job. However, now that August is here and the days are getting shorter, the sun rises at a more sociable hour. I’m sure you’ve all heard of golden hour, that magical time just after sunrise and before sunset, when the light is at its most photogenic. 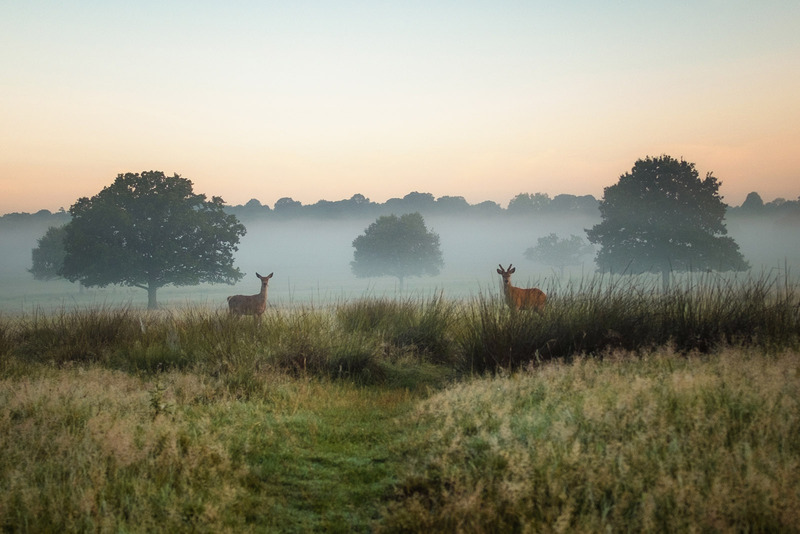 This is one of the best times to photograph Richmond Park in my opinion, especially if there’s a bit of mist around. On Friday I was very lucky with the weather. The conditions were perfect with no wind and plenty of low-lying mist hanging between the fields and woodlands. The deer, both red and fallow, were gathering near their watering spots and feeding in the grass. As I wandered the open fields near Duchess Wood, camera at the ready, I spotted these two red deer munching away in the grass. At first this scene seemed unexceptional, but as moved closer I spotted a rare photo opportunity. Behind the feeding deer three trees were perfectly aligned in the mist. Remarkably the deer were standing a little apart and at just the right spot to give the whole composition a natural, harmonious balance. Trying not to disturb the deer I set down my tripod, adjusted the camera and took the shot as quickly as a could. Just as I took shot the deer spotted me and slowly moved away. Luckily I’d captured them at the right moment. It definitely made setting the alarm for 5am worthwhile. Follow me on Instagram to see daily photos of Richmond Park and other landscapes. Thank you, Austen. I really appreciate your kind words.